I have a dream and plan to buy a Samsung Android Phone. 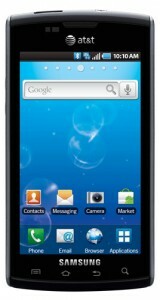 My friend bought Samsung Android Phone and i'm interested in it. But when he bought it, Android is still version 2.1. He said now was an update to version 2.2. I am curious and I buy a magazine to find information Android mobile phone and Samsung Android Phone. But Samsung Android Phone version 2.2 is not yet available on the market in my city.